Greg Cook creates, writes about, critiques, documents, organizes makers of, and (if these previous verbs are any indication) is invested in art, here in Massachusetts. We caught up with Greg, creator of the arts journals Wonderland and New England Journal of Aesthetic Research, to ask about his projects, the different ways he engages the arts, and why both vigorous support and criticism are integral to an arts community. ArtSake: We recently asked artists whether they separate or integrate their art from their other careers. This question seems especially pertinent for artists such as yourself who are also engaging the community in ways that go beyond art-making. How do you balance your work as an arts writer, organizer, chronicler, and community-builder with your work as an artist? Greg: I tend to get excited by my writing jobs and let them eat up my time for making visual art. It’s been especially tricky with The Great Recession coinciding with the arrival of my first child. Right now to make a living I’m juggling two regular writing gigs and a teaching job. It’s all art, right – writing, organizing, painting. I do try to integrate things, or perhaps make things do double duty as both visual art and journalism – like my photography. Or I try to drag my family along to art things as – supposedly – fun family outings. I’ve not been so successful at finding time to draw or paint. Which leaves me feeling antsy and guilty. 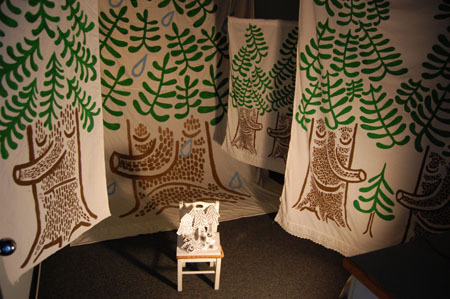 ArtSake: Your Enchanted Forest will be part of the upcoming Window Arts Malden Project. Why was it important for you to get involved in Window Arts Malden? Greg: It’s vital that artists participate in our own neighborhoods. In the art world, success tends to be defined by fame and money and museum shows and history books. Most of us artists are far from that. So how do we define success then? I think it’s about finding ways of making this often frustrating, dreary life a bit more fun, a bit more meaningful, a bit more wondrous. I like crosspollination. I was taken by some of the Asian artists in last year’s version of “Window Arts Malden.” And the windows project creates a pretty easy entry point for me to do something in public with my own paintings. I’m tired of art world hi/low, insider/outsider, fine/folk hierarchies that too often don’t foster better art but do serve to reinforce class and race barriers. 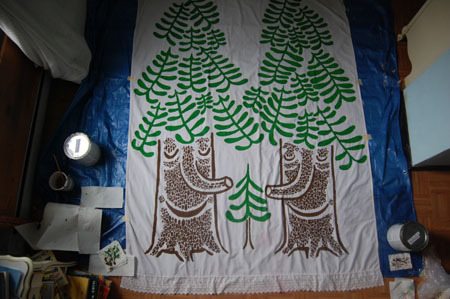 ArtSake: Can you talk about the origins and underpinnings of the “Enchanted Forest” project? 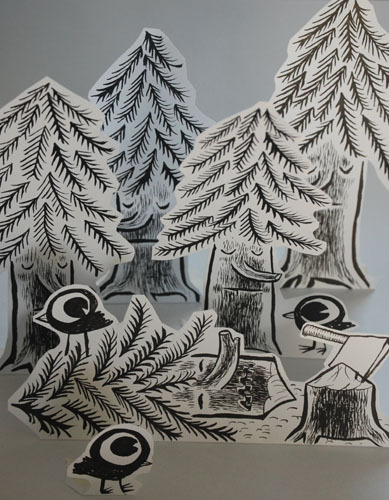 Greg: The “Enchanted Forest” is a place of magical trees and birds and witches and hungry wolves. The latest version will be in “Window Arts Malden” from Sept. 22 to Oct. 13. My goal is for it to grow into a walk-through environment. The idea originated when a friend was writing a fantasy novel set in a fictionalized New England. It occurred to me that the true story of the early European settlement here was a real-life fantasy epic – with “witches” and adventures into unknown worlds and culture clashes and racism and slavery and wars. And it had interesting parallels with our War on Terror. Some of my first pieces were painted flags addressing this history that I displayed outdoors around Gloucester. After a while I got to thinking of the New England woods – the awe-inspiring nature of the Transcendentalists, the haunted early colonial forests of Nathaniel Hawthorne’s story “Young Goodman Brown.” Then it turned sort of funny. Lurking underneath it was the haunted forest in Disney’s film “Snow White” and those fiberglass trees they used to have at McDonald’s restaurant playgrounds. You know, cartoony trees with faces on their trunks. Also those amazing, weird witch “history” museums in Salem. ArtSake: You’ve long been an art critic for many local and national publications. Can you talk about what role you strive to play when you write local arts criticism? Greg: I try to be fair. I try to be entertaining. I try to tell our histories – especially our local histories. I try to share things I love, and argue with things I disagree with. I try to leverage the power of my connections and the institutions I’m part of to foster a more rich community. A lot of journalism – or curating – is the basic choices we make of what things to highlight and what things to pass over. Our decisions send messages of what we value in our community, what we want more of, what we wish would just go away. I try to be mindful of the signals these everyday decisions send and try to focus on things that model the Boston that I’d like Boston to be. 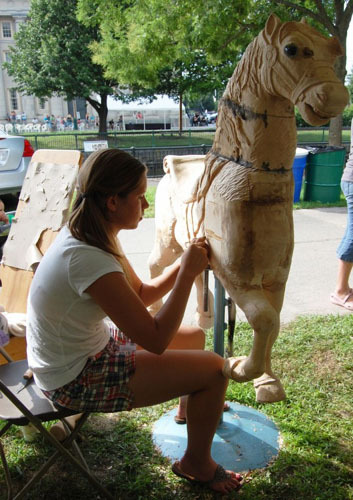 ArtSake: You are a vocal advocate of what you call “Yokelism,” or support of locally-made art. Why is Yokelism important? And have your feelings on Yokelism undergone any evolution during your time as an arts writer? Greg: Art makes our lives better. That’s why everyone goes everywhere listening to music and reading and watching videos on their smarty phones. And it’s even better when your neighbors are making some of that art. You might say it’s the difference between living in a town with lots of movie theaters versus living in Hollywood. You can see great movies anywhere, including lots of dull places, but it’s funner and sexier and more meaningful to be where cool stuff is actually being made. Having artists making good stuff in your town doesn’t just mean more cool art stuffed in every nook and café like they do in the wonderland of Somerville. These artists also bring cool ideas about what our government should do, what our parks and roads should be like, what our grocery stores should stock, what our schools should teach. When we primarily import art from Away we lose this vision of what our community can be. To be clear, I’m not a cheerleader for everything locally-made. Just ask public art folks. I want good, locally-made because I want to live in a more amazing place. And I do like the occasional art from Away. But there’s plenty of art being made here that could compete well with the contemporary art in our museums, but gets ignored. I mean our local museums generally even overlook artists here who are already in the history books. This isn’t just a problem here, but an art world geographical bias that hurts most American communities outside New York and Los Angeles. Too many curators and critics are interested in a certain few individual artists and approach art mainly as consumers of end products. I do love to look at pretty pictures, but I’m just as interested in how we foster the making of this stuff, how we foster art-making communities. What is our responsibility to our community as art world leaders, as public intellectuals? One of my favorite things about Massachusetts is that in our state constitution John Adams made it the law that our government should support the arts. Not because the arts boost our restaurant and tourism industries – though he liked a good hotel restaurant as much as the next founding father – but because they foster the “wisdom, and knowledge, as well as virtue” that are “necessary for the preservation of their rights and liberties.” In other words, our constitution says the arts are one of the necessary ingredients for a healthy democracy. Have my feelings on Yokelism evolved? The core idea is the same, but lately I’ve been thinking I need to better engage local donors, the folks on museum boards. In particular, I wonder about people who give our museums money to foster local art-making. ArtSake: What draws you to folk art, which you document as a photographer and writer? My heart breaks when I see mourning families at the annual “Mother’s Day Walk for Peace” in Dorchester carrying painted and printed banners honoring loved ones murdered during this city’s gun violence. 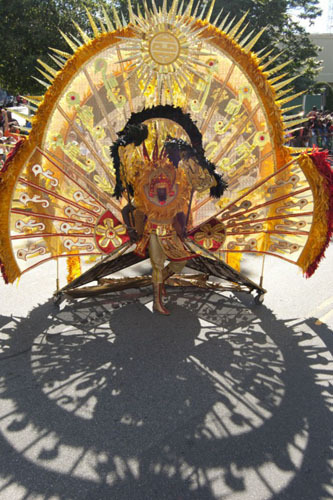 I’m dazzled by the hundreds of people in carnival costumes and sequins and feathers dancing through Dorchester for the annual Caribbean Carnival parade. When I watch people carrying the statues and paintings of saints through Gloucester during its annual St. Peter’s Fiesta, when I hear them shout the blessings, I’m knocked out by the passion and the beauty of it all. It’s just astonishing art. As a reporter, and particularly as a photographer, I’m allowed to get very close. It’s like mainlining the pure creative, passionate, community energy of the world. ArtSake: What’s the most surprising response you’ve had to your work? Greg: When I was first working as a reporter, a guy who didn’t like my reports threatened to shoot me. He said this to me in person. In front of witnesses. In a town hall. 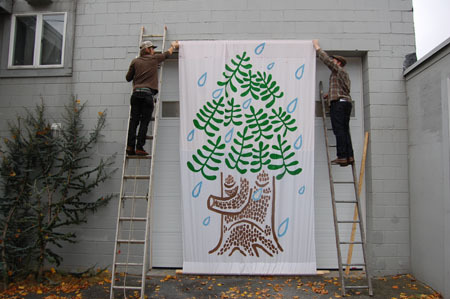 ArtSake: What would be your advice to an emerging New England artist? What do you wish someone had said to you when you were first starting out? Greg: Think bigger. Make the art you want to make. Create the community you wish to live in. Don’t wait. Greg: I’m organizing a big mini golf outing at Route 1 Miniature Golf (the Orange Dinosaur!) in Saugus on Sept. 21. The idea is a fun meet-up of Boston creative folks and their friends. Just because. Everyone’s invited – including you reading this now. I’m launching monthly arts and cultures talks at Malden Public Library beginning, I think, Oct. 8. I just finished a comic for the Boston Comics Roundtable’s kids anthology “Hellbound IV: Creatures and Monsters,” which is scheduled to be released at the Massachusetts Independent Comics Expo (MICE) on Sept. 28 and 29. I’m supposed to have prints in “The Message is the Medium: Prints, Propaganda, and Persuasion” at Zeitgeist Gallery in Lowell, from Oct. 2 to Nov. 2. And I’m trying to curate a show of art inspired by Krampus – the hairy Austrian Christmas demons – at Montserrat College of Art in Beverly, where I teach, from Dec. 4 to 17. Because, ya know, I’m all about bettering our community. Greg Cook is an arts reporter and critic for publications including The Phoenix (Boston and Providence), Art New England, and WBUR’s ARTery. The New England Journal of Aesthetic Research, which he founded, won a 2009 Creative Capital | Warhol Foundation Arts Writers Grant. He oversees the New England Art Awards, an annual open-source, community project to honor art made in the region, and he teaches at Montserrat College of Art. His art has appeared in Nickelodeon magazine, Publishers Weekly, and The Believer, and has been widely exhibited both locally and internationally. Images: all images courtesy of Greg Cook. The photos from Cambridge International Carnival and the Lowell Folk Festival were taken for WBUR’s ARTery.